NASCAR Champions week in New York City continued on Thursday as the most accomplished drivers from the NASCAR Touring ranks in 2005 rubbed shoulder with the top NASCAR Nextel Cup brass and drivers. It was obvious that there was mutual respect between all of the champions no matter at what level they race. 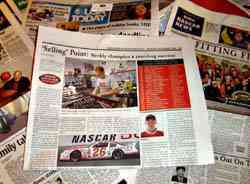 Today in his hotel room Thursday morning and found a special section about NASCAR racing that featured a half-page spread on the Dodge Weekly Racing Series champion. The champions then got to watch the opening video segment before they went out to meet the public. However, their spot behind the stage meant that viewing the screen was done so from behind it. Everything was backwards, so the racers got to see Tony Stewart’s #02 car go for a spin while Greg Biffle’s #61 and Carl Edwards #99 was also featured in the montage. Several touring drivers congratulated Rusty Wallace on his retirement back behind the stage. In return, Wallace offered some praise of his own. 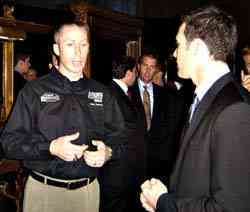 All of the drivers got a chance to attend a “meet and greet” during the NASCAR Media Luncheon in Manhattan. The event is billed with a lesser title than it actually deserves. At the event, NASCAR’s Brian France delivered the annual “State of NASCAR” address while Nextel big wig Tim Donahue expressed what the sport has done for the Sprint/Nextel company. 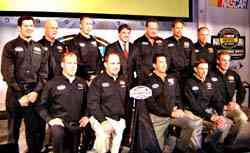 Every driver who won a NASCAR national championship in 2005, a total of 12, and the other nine drivers who took part in the Chase for the Nextel Cup Championship, were introduced on stage to start the event. Before they were paraded in front of the audience, the drivers assembled behind a lavish stage at New York Cipriani’s theatre and did what they do best – bench race. Then it was time to go out on stage. The drivers handed off personal items such as sports jackets and cell phones before heading out. This writer resisted the temptation to pillage Seller’s phone for a few choice numbers, such as Richard Childress’, for whom he will drive in NASCAR’s West Series next season, as I was safeguarding it, but decided against it. Payton Sellers made some big headlines. The afternoon was topped off when the touring champs and the NASCAR stars joined up to face television cameras, reporter notebooks and flashbulbs to meet a gaggle of media members in New York to cover the NASCAR festivities. After the performance of the short trackers, Seller’s spread in USA Today is likely to be just the tip of the iceberg when it comes to coverage of the NASCAR Touring champions this week. The drivers will next appear at a special NASCAR Champions Dinner at the Waldorf-Astoria’s Empire Room on Thursday evening. Speed51.com will be walking along them for every step along the way and we’ll have more stories and photos for you from the Big Apple. 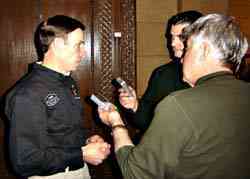 Tony Hirschman (L) gets a little attention as he talks to reporters.